How Cute Is This Irish Gift? The adorable teddy bear decked out in a shamrock bow and this popular Irish Blessing in a modern, sleek clear acrylic frame with easel back is a winning combination. This unique gift also makes a thoughtful birthday, St. Patrick's Day or anniversary present for a parent, grandparent, aunt, uncle, sibling, etc. 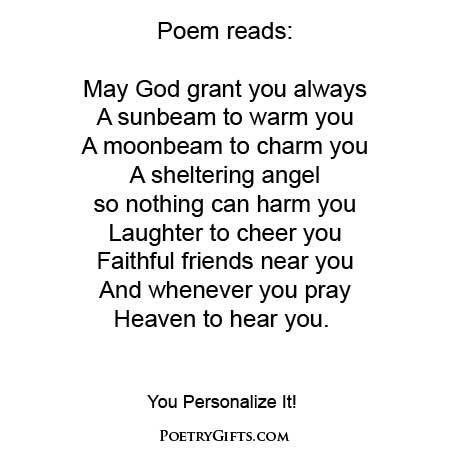 Personalize this Poety Gift with names, an optional date, and a personal message. Add a favorite photo to make this an extra special Irish gift. What better gift to give your mom and dad, husband or wife, grandma and grandpa and other family members and friends than an Irish Blessing asking God to protect him or her and listen to his or her prayers. 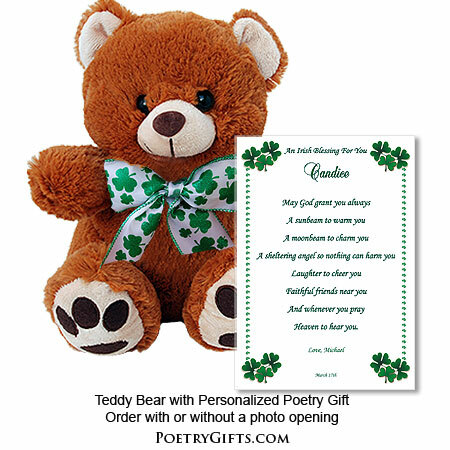 This unique Irish Poetry Gift includes a 10" teddy bear with a personalized Irish Blessing framed in a modern clear 5" x 7" acrylic frame with easel back. Can be personalized for St. Patrick's Day, an anniversary, birthday or any special occasion. 1. Optional Phrase Above Name - Examples: Happy St. Patrick's Day, An Irish Blessing for you, etc. 3. Closing Phrase and Your Name (as seen after poem) - Examples: Love, Nick; With Love, Mom & Dad; etc."